Three reel online slots come in all shapes and sizes and this release from iSoftBet has a bit of everything; it’s called Absolute Super Reels and it comes with extra features, optional extra bets and a progressive jackpot – find out more below. 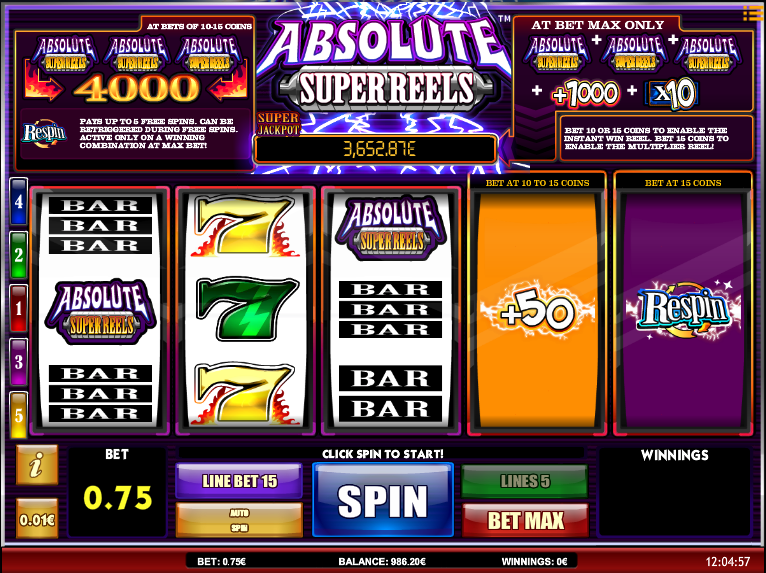 Absolute Super Reels is a three reel slot with three rows and five fixed paylines; there’s no real theme to this game but it is reminiscent of a physical machine in some respects. The symbols are largely familiar and include the game’s logo, sevens of different colours – gold, red, blue and green and then single, double and triple bars. Symbols of a similar type can be mixed together for smaller wins. There are no wild or special symbols in Absolute Super Reels but there are the extra reels on the right hand side which is explained below. Reel Four (10+ coins) – adds an extra 50, 750 or 1000 coins to a winning combination. Reel Five (15 coins) – any wins will be subject to a multiplier of 2x, 5x or 10 if this reel is active. Up to five free spins can also be awarded here if the ‘Respin’ lands on a winning combo. 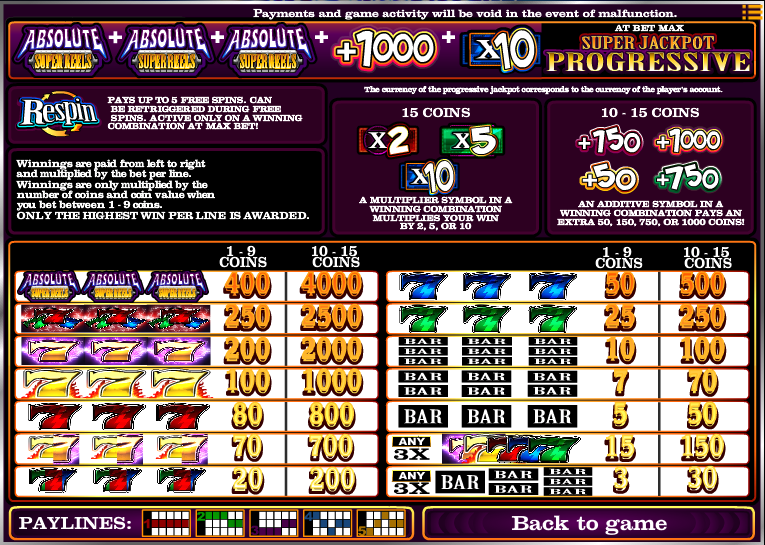 The jackpot total is shown above the reels in the centre of the screen and it can only be won by landing a specific combination of symbols – three ‘Absolute Super Reels’, a 1000 coin win on reel four and a 10x multiplier on reel five. Absolute Super Reels introduces some interesting concepts into the genre with the optional fourth and fifth reels and it works well, regularly combining with the first three reels to come up with some action. There’s an RTP of 95.24%.